Though the Warriors got blasted on their home floor, the story of the night was Stephen Curry’s injury that forced him to leave the game early in the third quarter. The Warriors are calling the issue a a left adductor strain (groin). Videos appeared to show him landing awkwardly while trying to defend a fast break late in the third quarter. Before exiting, Curry struggled against the Bucks’ excellent defense, scoring just 10 points in 26 minutes while going 0-for-4 from 3-point range. Curry is playing some of the best basketball of his career to start the 2018-19 season, and entered the season healthy after dealing with a myriad of issues last season. It is unclear at this time what the severity of the injury is, but Steve Kerr said postgame that Curry will get an MRI on Friday. The Bucks entered Thursday’s game with the best point differential and second-best record in the Eastern Conference. They showed that hot start wasn’t a fluke against their first real test of the 2018-19 season. Milwaukee was better than Golden State in nearly every way, and thoroughly dominated the Warriors from the second quarter onward. Golden State finished the first half with just 51 points, their lowest tally since their only other loss of the season vs. Denver. The Bucks shot the ball better (51.1 percent to 48.3), outrebounded the Warriors (46 to 38), had more assists (33 to 30) and committed less turnovers (18 to 12). Though the lack of Draymond Green certainly hurt Golden State on the defensive end (more on that later), the Bucks’ length on the defensive end made things difficult for the Warriors all night. Kevin Durant struggled, especially while matched up vs. Giannis, committing six turnovers and scoring just 17 points. Durant finished the game with a point differential of -28. Klay Thompson finished with a -28, with Curry finishing at -26. With Draymond sidelined due to injury, the Warriors had no answers for Milwaukee at the rim. 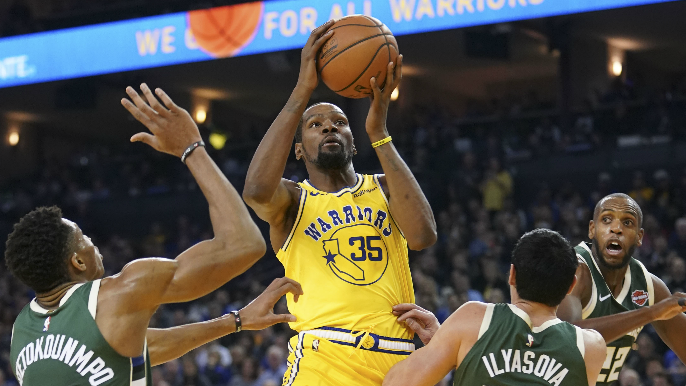 The Bucks scored a whopping 84 points in the paint to Golden State’s 34, and at times made Jordan Bell, Damian Jones, and Kevon Looney look helpless. This was especially true when one of the three were switched onto Giannis Antetokounmpo, who frequently bullied Golden State on drives to the basket, earning 11 free throws. Antetokounmpo only played 26 minutes, but looked like an MVP candidate, finishing with 24 points and nine rebounds, while playing excellent defense all night.